Hillary Rodham Clinton, the singular most qualified person to ever run for president, lost the 2016 election despite winning the popular vote by 2,864,974 votes. Hillary’s book, What Happened, published less than a year after her unforeseen defeat by Donald Trump, is a personal and comprehensive reflection on the 2016 election. The title alone is enticing because it is a clear, concise statement that is poignant in its simplicity. Countless others, no doubt, will parse and parry for years to come over what happened and why. This book, however, provides a unique insight into the 2016 election. One theme runs through the book. Hillary—and everyone around her—thought she would win. The fact that she won the popular vote, but lost due to the Electoral College is galling. 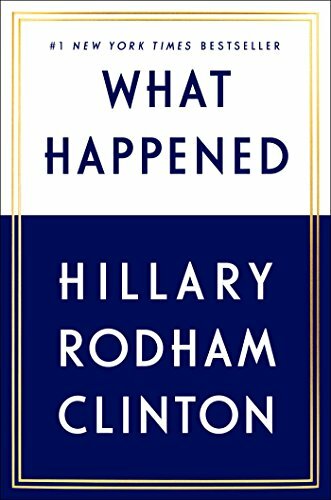 What Happened takes the reader from Hillary’s decision to run, through the primary and the general election campaign, and into the aftermath. It’s a view from the ground up, and everything is laid out. Not everyone will agree with her analysis—and that is unimportant. What remains is a detailed account of what happened . . . to her and to the country. It’s her book and her perspective. And she gives it the gravitas it deserves. At times, intensely personal, at others, extremely wonky, the book is pure Hillary. There is a sense of freedom in this book. It is grounded in the fact that Hillary Rodham Clinton will never again run for public office. There is no further need to cater to the vacillating whims, demands, and expectations of the electorate, donors, or the media. Losing the 2016 election gives Hillary the opportunity to opine, dream, comment on, and predict. She freely admits that many people just do not like her. And she admits that hurts. This is a personal book giving readers a rare glimpse into the world of one of the most buttoned-up women in the public eye. By turn, funny, sarcastic, sad, angry, insightful, thoughtful and prophetic, the book takes reader is taken on a tour of the soul-searching Hillary engaged in after her defeat. Why did she run? She realized she could lose. Her husband, former President Bill Clinton, reminded her that she might lose. That had already happened once. But she persisted. The chapter “Get Caught Trying” presents one of the best “fly-on-the-wall” experiences. This happens throughout the book, and it’s attributable to Hillary’s writing style, which is not wonky at all. This chapter is about sausage-making nature of a campaign, and it is not pretty. There is the “caricature of me as a power-hungry woman” that Hillary acknowledges was a factor she considered. Considering that no man is every accused of being “power-hungry” or criticized for being ambitious when seeking political office, these accusations carry the stench of misogyny that Hillary faced. If nothing else, the 2016 election confirmed what all women instinctually understand: They are held to a different, and higher, standard than men. The section entitled “Frustration” is particularly interesting. Reviewing various occurrences during the campaign, with the benefit of time and distance, reminds readers that she was held to a much higher standard than her opponent. The “Commander in Chief Forum” in September 2016 is a case in point. Matt Lauer cut Hillary short on answers after spending most of the allotted time asking about emails. He then lobbed softball questions to Trump and treated him with kid gloves. Still she persisted. As the only qualified person running for president, it is ironic that she was criticized for being too prepared. She criticizes the Republican congressional leadership for doing everything they could to keep the American public in the dark and vulnerable to attack by a foreign government. She calls Trump “the perfect Trojan horse for Putin.” Overall, the chapter is staggering. After reading the book, a question arises as to whether those who trashed it actually read the book . . . or did they only read some of it? That is a mistake. What happened? There is no need to imagine because everyone has a courtside seat to the ongoing disaster that is making America irrelevant.